The Baylor community is experiencing a significant increase in fraudulent email attacks. 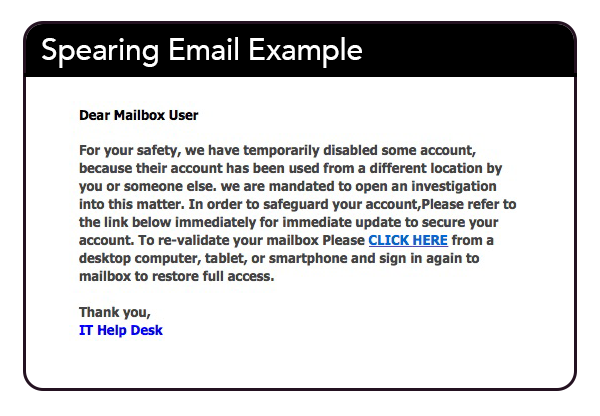 Email accounts and personal information are being compromised as people respond to "spearing" messages that pretend to be from Baylor Information Technology Services (ITS), Baylor email accounts, Canvas, Blackboard and other trusted sources. An example of one common fraudulent email that was sent from a compromised Baylor email account appears at the bottom of this messsage. Baylor ITS will NEVER send you an email that contains embedded links or that asks you to either send or complete an online form that contains sensitive, personal information (e.g., account passwords, social security number, bank account routing numbers, credit card information). Spearing is a widespread email-based scam that attempts to lure you into providing personal information based on some sort of threat or opportunity. The emails may appear to be from a credit card company, a bank, a friend, or some other trusted institution, including Baylor University. Never reply by email to a message that requests sensitive information. Do not click links that are embedded in email messages (even if the URL appears to be legitimate) and do not submit personal information on the web sites where these links lead. If you believe the request or inquiry may be legitimate, open a web browser and type the primary URL for the company or institution making the request. Do not use the links mentioned in the email message to navigate to the web site. Spearing scams require your cooperation and the best way to stop their proliferation is to avoid clicking embedded links or replying to email-based requests for sensitive, personal information. If you have any questions, or believe that you are a victim of a phishing scam, please contact the Baylor ITS HELP Desk at (254) 710-4357. To keep up with the latest information security news and tips, like BearAware on Facebook and follow @bearaware on Twitter.